Handcrafted elevator ankle boot to increase height from 2.4 (6 cm) up to 3.1 inches (8 cm) in dark brown full-grain calf leather and tone-on-tone leather sole stitched at sight. 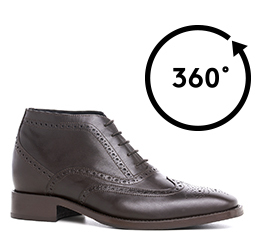 The characteristic English "Brogue" design is hand stamped by the GuidoMaggi artisans. Ideal to match with a suit or with jeans and a blazer. The GuidoMaggi master craftsmen allow to customize the shoe according to any specific request.